Pinatas have been used for many years in Latin America to celebrate birthday parties. Although the tradition is suppossed to have been born in Europe, it has died down there but is now very strong in all Latin America. Furthermore, in the last 50 years it has crossed over to North America, where now the word “pinata” has become quite popular. Legend has it that the pinata party game started simply as a painted clay pot decorated with colorful paper and filled with candy treats and coins. Even today, many party-goers in central and southern Mexico are still using the clay pot as opposed to the paper Mache pinata North Americans are accustomed to. The tradition spread to the New World and flourished. Artisans created animal and other pinata designs to delight children at festivities and provide an entertaining activity for young and old party-goers alike. Although breaking a pinata at children’s parties is very much a tradition among Hispanics, the fun game has spread throughout the entire United States since the 1960′s. It has replaced the game of “Pin the Tail on the Donkey” as the party game of choice. 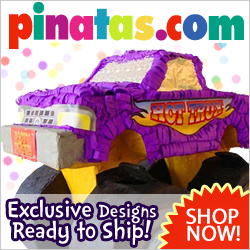 Our pull pinata design is for toddlers and for folks sensitive to any display of aggressive play. Today pinatas are not only popular as kids birthday party games but they also make great party decorations and centerpieces.